(Newser) – Astronomers searching for life beyond our solar system may need to look no farther than a little, feeble, nearby star. 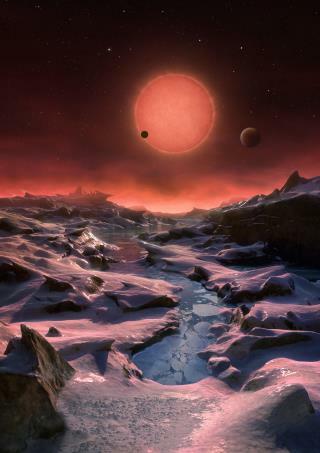 A Belgian-led team reported Monday that it's discovered three Earth-sized planets orbiting an ultra-cool dwarf star less than 40 light-years away. It's the first time planets have been found around this type of star—and it opens up new, rich territory in the search for extraterrestrial life. Because this star is so close and so faint, astronomers can study the atmospheres of these three temperate exoplanets and, eventually, hunt for signs of possible life. They're already making atmospheric observations, in fact, using NASA's Spitzer Space Telescope. The Hubble Space Telescope will join in next week. quick, let's abort them. they are not human yet!!!!!!!!!!! I wonder if Jesus gets tired of being crucified everywhere there is "intelligent" life? Just 40 lightyears away? We can make that trip on one of them Delta II rockets!